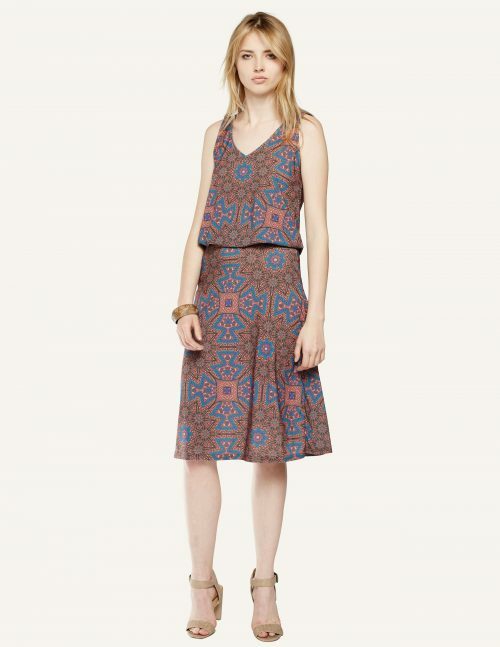 This bra-friendly dress is perfect midi-length, and the drop waist styling is so easy to wear. Fabric is 93% Microfiber Polyester I.T.Y., 7% Spandex Hand wash cold water and hang dry. Easy care, no wrinkle jersey fabric, great for travel. Made in the U.S.A. The Oxy is a chic refined dress that you can dress up or down and can wear year round. This dress features a scoop neck and elbow-length rouched sleeves, as well as black contrast stripes on the sides. Fabric is 93% Microfiber Polyester I.T.Y., 7% Spandex Hand wash cold water and hang dry. Easy care, no wrinkle jersey fabric, great for travel. Made in the U.S.A.
Styled with a rouched back collar 3/4 sleeves and deep V-neck, this signature fit ’n flare dress takes you from day into night. It’s perfect for the office or hanging out with friends after work. A seam at the natural waist flatters and defines the waist. Fabric is 93% Microfiber Polyester I.T.Y., 7% Spandex Hand wash cold water and hang dry. Easy care, no wrinkle jersey fabric, great for travel. Made in the U.S.A. This racer-back maxi features ruching on one side and a V-neck. It’s perfect for date night, or throw on a blazer and wear it to a work function! Fabric is 93% Microfiber Polyester I.T.Y., 7% Spandex Hand wash cold water and hang dry. Easy care, no wrinkle jersey fabric, great for travel. Made in the U.S.A. This racerback top is perfect under blazers and cardigans for work or with your favorite skinnies for a night out on the town. The elasticized bottom hem makes it easy to wear with your favorite pants. Fabric is 93% Microfiber Polyester I.T.Y., 7% Spandex Hand wash cold water and hang dry. Easy care, no wrinkle jersey fabric, great for travel. Made in the U.S.A. This dip-dyed scoop neck dress featuring front ties is chic and flattering, and the fabric is super-comfortable rayon french terry! Fabric is 95% Rayon, 5% Spandex Machine wash cold and tumble dry low Made in the U.S.A. This belted dress features a surplice top and shoulder ruffles! It’s flirty but could still be worn to a work function! It’s modern yet has vintage appeal at the same time. Fabric is 93% Microfiber Polyester I.T.Y., 7% Spandex Hand wash cold water and hang dry. Easy care, no wrinkle jersey fabric, great for travel. Made in the U.S.A. 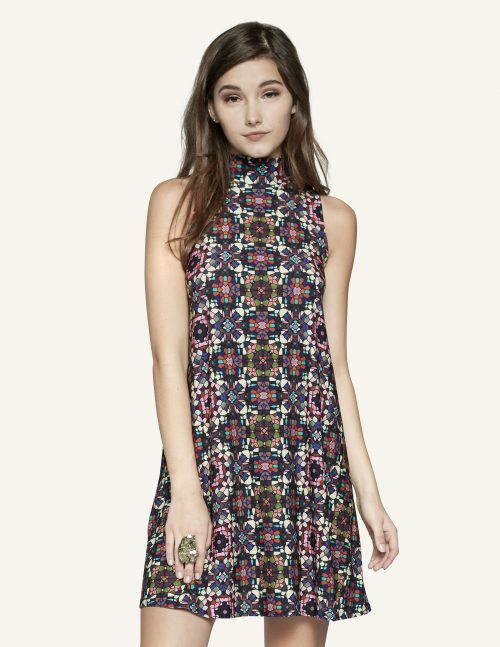 This mod A-line dress features a mock turtle neck. Throw on a denim jacket or cardigan with some booties and wear it out to dinner or to a work function! Fabric is 93% Microfiber Polyester I.T.Y., 7% Spandex Hand wash cold water and hang dry. Easy care, no wrinkle jersey fabric, great for travel. Made in the U.S.A. This dip-dye flutter sleeve top features front and back V-neck and is so cozy and chic! Fabric is 95% Rayon, 5% Spandex Machine wash cold and tumble dry low Made in the U.S.A. This dip-dye fit ’n flare dress styled with V-neckline is both chic and comfortable! Fabric is 95% Rayon, 5% Spandex Machine wash cold and tumble dry low Made in the U.S.A.
Long sleeve dip-dye top features slits and high/low hem and is so comfy on the body! Fabric is 95% Rayon, 5% Spandex Machine wash cold and tumble dry low Made in the U.S.A.